“The patience of Job” generates an immediate image for most English readers, having been a standard phrase ever since James’s commendation of Job was translated into the King’s English (Jas 5:11). Even those who are not biblically literate have some knowledge of an ancient man who suffered through great afflictions. Patience, however, is not what the biblical account of Job is about. Indeed, one who reads the entire book will learn that Job ran out of patience early on and filled the air with complaints and accusations toward the God who had left him lorn and lone. Job did show great endurance (a better translation of the word used in Jas 5:11), but he was not always patient. Most people find themselves, at some point, experiencing unexpected pain and sensing some kinship with Job. Like Job, we want to know why suffering comes our way, what we may have done to deserve it, and whether God is playing fair. The book of Job recounts a dark and dangerous journey toward unseen insights that challenge both human assumptions and traditional theological beliefs. Those who dare to enter Job’s world may discover that their own world–or view of the world–has changed in surprising ways. In the end, however, those who stick with the ancient sufferer may discover spiritual depths they had not previously imagined. 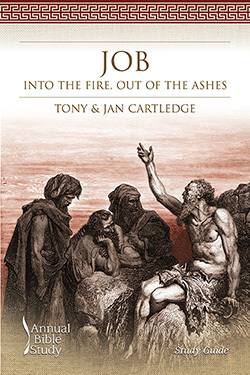 In the Job Annual Bible Study, Tony Cartledge is primarily responsible for the introduction, the commentary sections, and any sermons or sermon outlines. Jan Rush contributed the teaching and worship planning suggestions and is wholly responsible for the youth Bible study section. Each chapter in the Job Teaching Guide includes teaching options, a suggested worship outline for both a contemporary and traditional service, and approaches for leading discussions. The study examines biblical background, historical interpretation, as well as spiritual, ministerial, and theological themes. It also includes relevant lesson plans for children and youth. The Job Study Guide serves to educate the learner on major issues of appropriate interpretations, to offer an overview of theological themes, and to build the learner’s Bible study skills by considering several significant interpretations.